We are still human. We might be damned, but we still look upon the works of God and Man with joy in our hearts. Fate has seen fit to grant us eternity. Whether this is a blessing or a curse remains to be seen, but we will let the children of Seth guide us. They are the truly favored of God, after all. 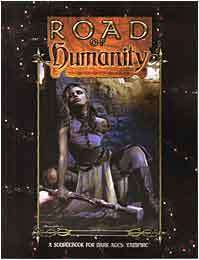 The last of the Road Books for Dark Ages: Vampire, Road of Humanity includes everything necessary to play one of the Prodigals. The history of the road, its evolution alongside humanity from the time of the First City, the current practices of its followers, and the most important Prodigals in the War of Princes are all detailed herein. Come walk the Via Humanitas. It's the only sane option.